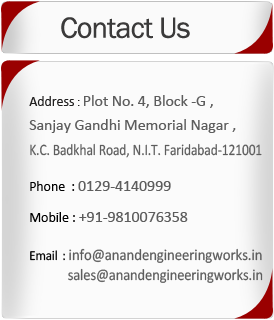 The foundation of Anand Engineering Works was laid down in 1992 by Late Shri. Vedprakash Sodhi. Business nature in beginning years of Anand Engineering Works was mainly associated with Government tenders and supply in public works mainly associated with irrigation departments,floods departments,SDO departments and so called other govt. organizations . In mid part of eightees, Indian market saw growth of private sector in Earthmoving and Construction industry and we become top guns for northern India's trade with huge stocks for P&H cranes,HM cranes, Draglines and then popular excavator series like standford and case poclain excavators. With flow of time, we vast our product range and now we are proudly say that we are one of better stockists and wholesalers in India construction industry with huge stocks for all popular models of Cranes,Dozers and Excavators not only in India but also in adjoining countries namely NEPAL,SRILANKA etc. Our vast range of products consists of mainly Ground engaging tools,Undercarriage,Engine parts,Crane and Dragline parts,Attachment parts for excavator,Hydraulic pumps,Transmission parts,Brake parts etc. AT PRESENT, OUR PRODUCT RANGE Cover all machines whatever nature of work they are employed in. In late,we have excelled in bulk imports from factories of china and wholesale distributors in China,Singapore,Malaysia UAE, USA, and other countries worldwide to improve quality of products and cost reductions. we are proudly associated with best of construction companies in India and also provide our services to hundreds of dealers in India. We look forward to excel in earthmoving spares industry and seek support of our suppliers and buyers in near future.